Coligny Beach Park is easily one of Hilton Head Island's top-rated beaches, and it won't take new visitors very long to discover why. From the extensive free parking to the kid-friendly splash pad, the park is remarkably accommodating, and simply gorgeous, with modern beachy architecture and small seaside touches throughout, from the changing rooms to the wide, well-used boardwalk that leads directly to the seashore. 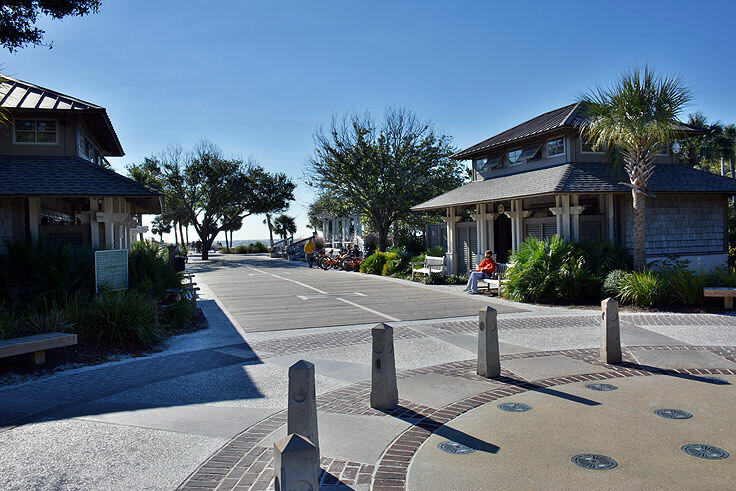 Coligny Beach Park is located close to the southern end of the island on Pope Avenue, adjacent to a circular "loop" that connects the road with a number of neighboring beach resorts and hotels. The park features ample parking close to the main entrance, which, unlike a number of other public beach accesses in the area, is completely free. The entrance to the park will wow newcomers, and is anchored by a circular brick splash pad that's incredibly popular with the park's youngest visitors. With a shallow "pool" that's filled continuously with a dozen bordering fountains, kids will have a blast splashing in the cool water before they even hit the sand. Rows of wooden benches line the fountain, as well as parking for bicycles. 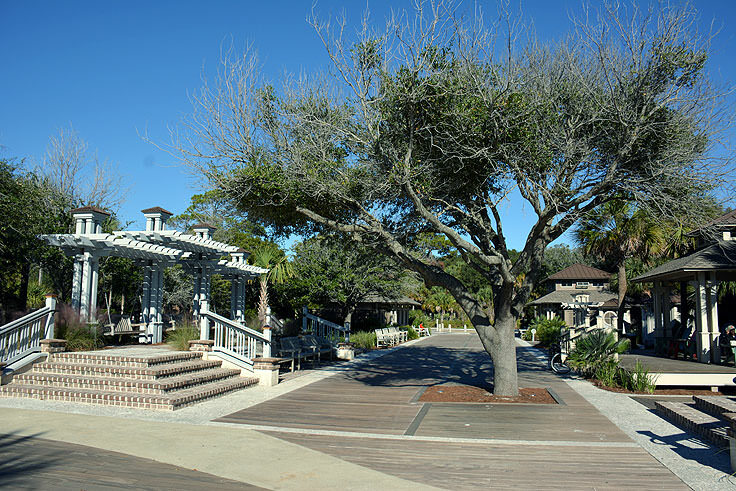 Just past the fountain at the entrance, a wide boardwalk that's speckled with oak trees leads visitors directly to the oceanfront. Along the way, beach-goers will find a line of impeccably clean restrooms, cute and coastal changing stations, outdoor showers, and seasonal beach rentals for folks who didn't bring along their chairs and umbrellas. 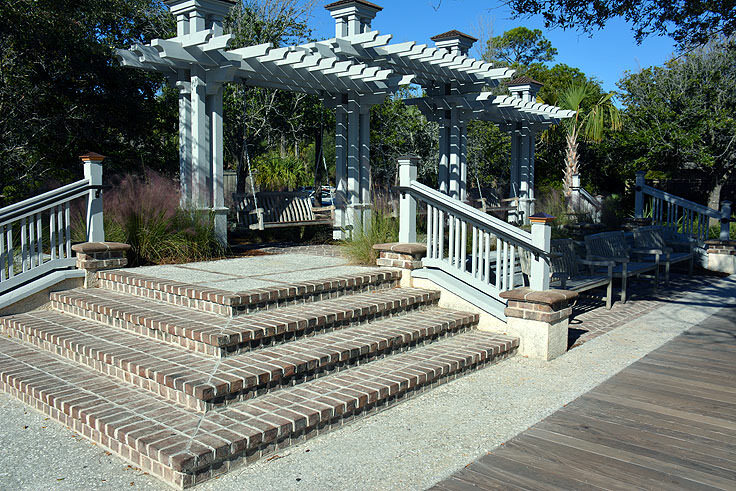 Wireless internet access is available throughout the park as well, and can be accessed via a shaded park bench along the extensive boardwalk, or in the comfort of a large shaded gazebo - one of the Coligny Beach Park's most relaxing spots off the beach. 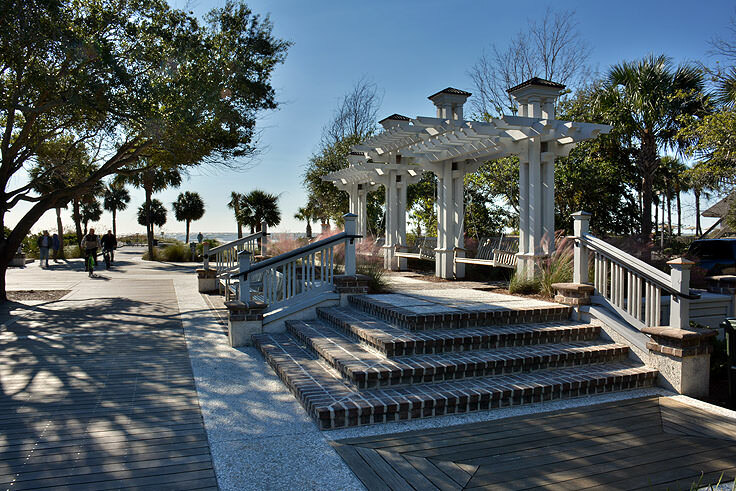 Visitors are free to explore the boardwalk as it runs parallel to the seashore, bordering blooming crepe myrtles and native Palmettos, or can head right to the sand, where handicapped-accessible beach matting and seasonal lifeguards are waiting. 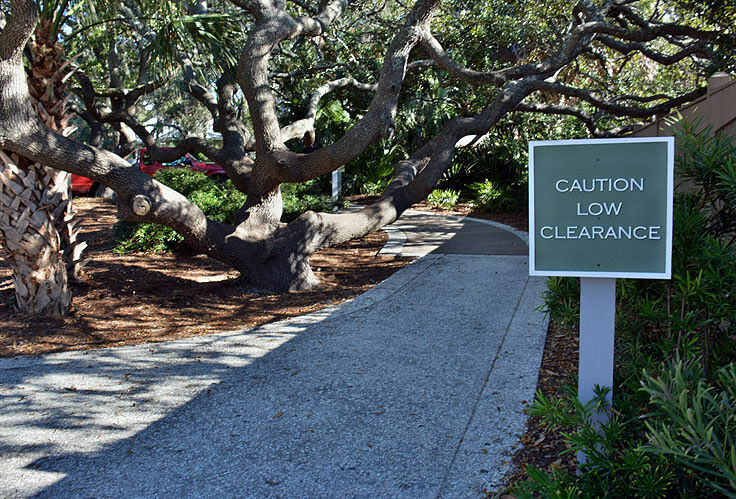 Coligny Beach Park is, in fact, one of the few seasonally handicapped accessible beaches on Hilton Head, making it an immensely popular destination for both locals and visitors alike. The seashore itself is nice and wide, (although its width tends to fluctuate with the incoming and outgoing tides), and features gentle ocean waters with an expansive, flat sandy bottom. This makes it easy for kids and adults alike to wade out without fear of a steep drop-off or imposing, crashing overhead waves. After a long day on the shore, visitors can pop into one of the neighboring resort restaurants for a cool drink or a post-beach meal, or can walk past the parking area to a number of local shops, boutiques and eateries. Considering that all of these amenities are fairly well packed within a half mile region or so, it's no difficulty to spend a full day at the Coligny Beach Park and never run out of things to do. Visitors should note that because of the many amenities, proximity to local resorts, and overall well-maintained beauty of the park, Coligny Beach Park is easily one of the most popular beaches on Hilton Head Island. While there's always room to spread out a beach towel, new visitors should note that they will likely be sharing the sand with other beach fans, including locals, day-trippers, and guests of the neighboring resorts and hotels. That being said, Coligny Beach Park is popular for a good reason. 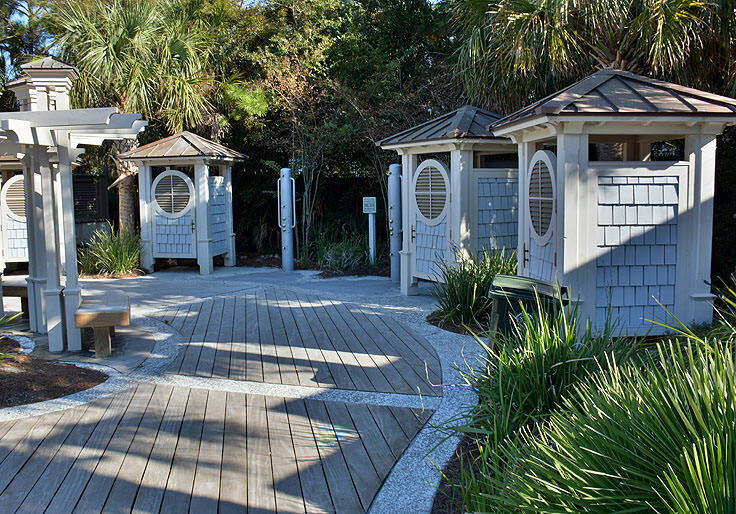 Clean restrooms, a cool environment on and off the beach, and free parking all help make this little destination a stunning locale to enjoy the ample Hilton Head shoreline. The beach is open seasonally, with hours of operation that change with Daylight Savings Time. In the summertime, the park is open every day from 6:00 a.m. until 9:00 p.m., and in the winter months, the park is open every day from 6:00 a.m. until 6:00 p.m. Visitors are encouraged to come early or late to secure a parking spot, especially on busy summer and holiday weekends. 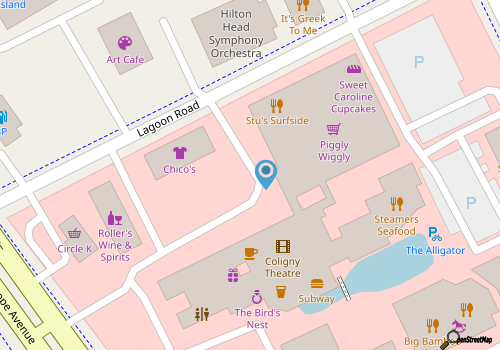 It's also very easy for many visitors staying in the southern Hilton Head area to bike to the park, and all amenities within the park, (with the exception of the beach rentals), are free and available on a first-come, first-serve basis. Coligny Beach Park is an exemplary patch of shoreline that sums up quite fittingly what Hilton Head Island is all about. A little on the upscale side, with posh amenities and everything a beach-goer could need, (but with careful attention paid to the beautiful natural beach landscape), visitors from all regions are sure to fall in love with the park, adding to its reputation as one of the best public beaches on the island.